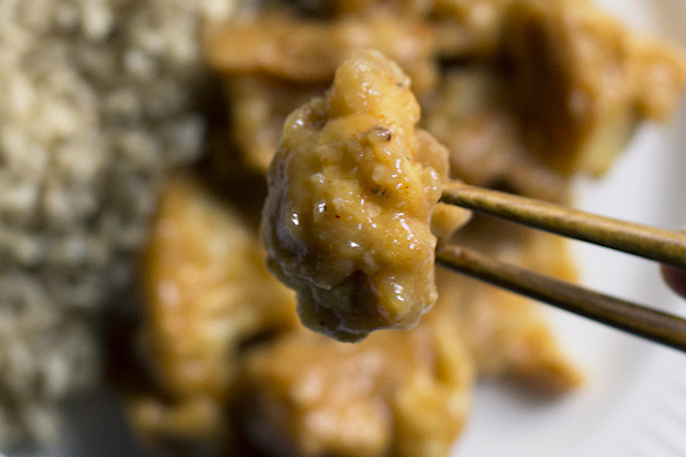 Do you have the same fond memories of eating orange chicken as I do? Walking into my first Chinese restaurant was like stepping into a majestic foreign land. If you know me personally, you know I have the worst memory, so I can’t recall the exact restaurant, but I bet it was in China Town. And I bet it was with my whole family. You see, as a kid, my extended family would head over to this awesome Chicago neighborhood, where China comes to life. Standing in front of its various culturally-influenced structures, there we were with smiles from ear to ear. And the food? Well, that’s a given, right? 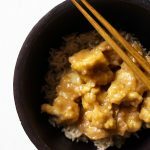 As a kid I wasn’t quite ready to try out new foods but what I was always ready for was that orange chicken and white rice kind of life. If I felt really adventurous, well, that’s when soy sauce made an appearance on my plate. What I really loved about orange chicken was how beautifully the array of flavors, and the sauce made up of them, perfectly stuck to every crevice of that delicious morsel of heaven. Fast forward some 20-odd years and I started wondering how I could recreate it at home, using clean ingredients. Of course, I’m always looking to make addicting veggie based recipes too, so I decided to fuse my two desires into one irresistible dish. The result? This sweet & spicy orange cauliflower. And, man, are you going to love it. I can say that because I asked several people of all flavor palates to try it and guess what? I’ll just let you get right to it! Enjoy on top of some riced cauliflower and continue your love affair with this versatile vegetable. 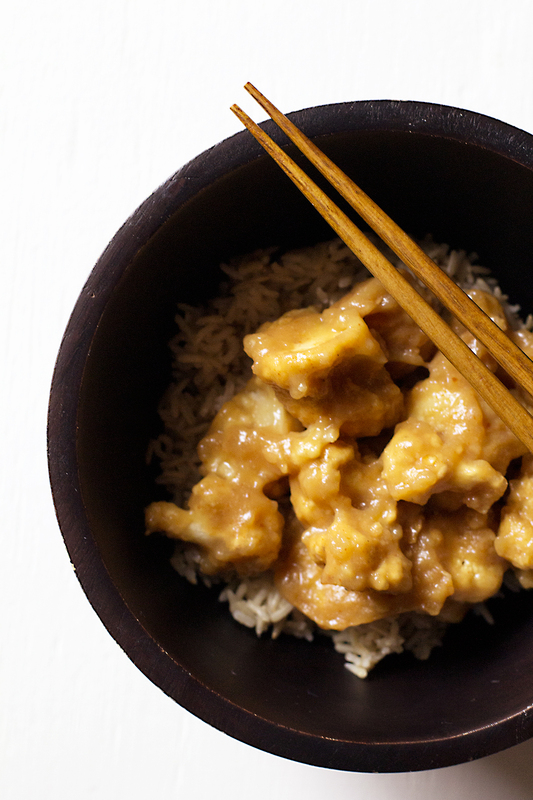 This new take on your old favorite Chinese takeout will have you tossing out your takeout menu! Its tangy orange flavor pairs perfectly with the dark soy sauce. Combine wet ingredients into a bowl until the mix thickens. After cutting up the cauliflower into pieces, toss them in the wet ingredient bowl and mix until fully covered. Then dip each piece into the dry ingredient bowl. Finally dip again in the wet ingredient bowl. Put leftover wet and dry ingredients into one bowl and put to the side. 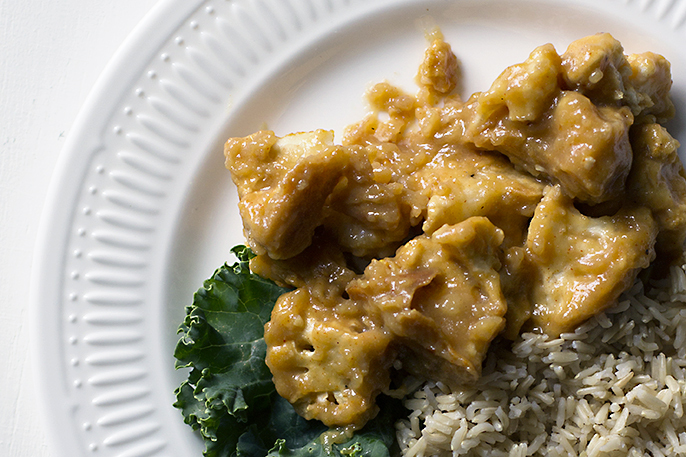 Now is the time to start cooking some rice, if you plan to have the cauliflower with rice. Put the cauliflower mix in the oven for 20-25 minutes. Ideally, you’ll want to cook the rice at the same time the cauliflower is cooking in the oven. That way they’ll be ready at the same time. After baking the cauliflower for about 10-15 minutes, you can start cooking the sauce. Combine all sauce ingredients (including the leftover wet/dry mix) in a large pan and cook until it thickens. Add the cooked breaded cauliflower into the sauce mix. Serve over rice.